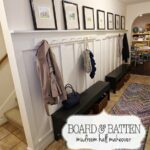 When I revealed our Board and Batten Hallway Makeover a week ago, I promised to share how I created the art that rests on the top running board. 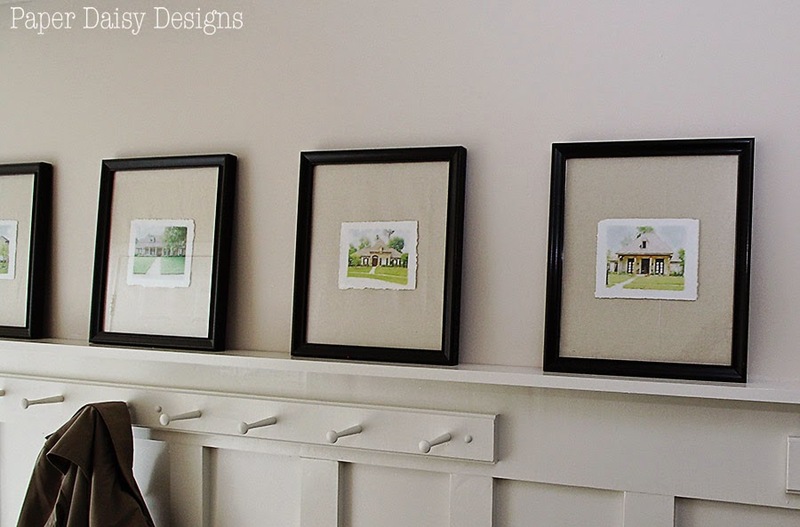 The art, watercolors of each of the seven houses we’ve lived in and have called home, is very special to me. 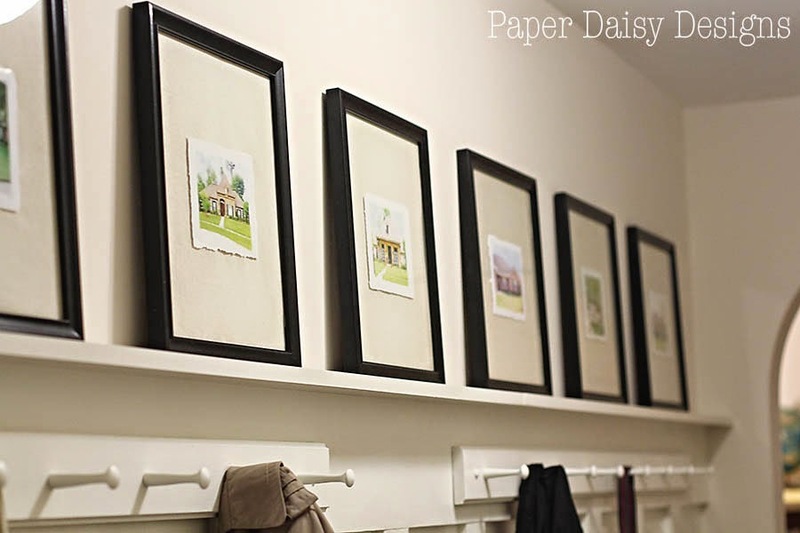 They create the perfect, harmonious gallery wall for this basement entry. Even when you’ve moved as much as we have, each home is filled with special memories, good times shared with neighbors, friends and family. Creating the art was rather easy. No paint brushes required. I used an app on my iPad called Waterlogue. The hardest part, I found, was gathering all the photos. Some were easy to track down on my computer; others were more elusive, tucked away in boxes. 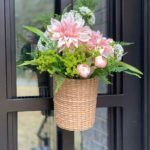 Some required the help of a past neighbor or even a mother to recapture the front of the house in just the right angle. Thanks Mom and Kelly! 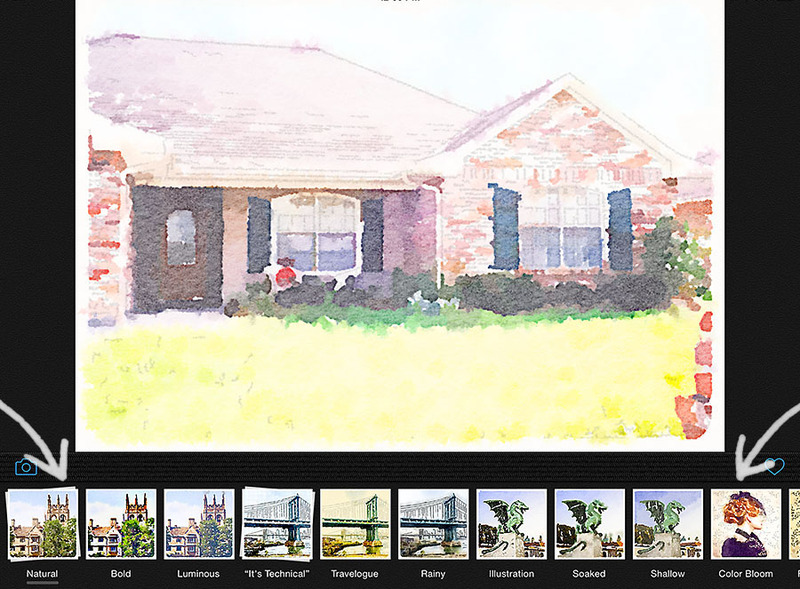 For each house, I sent the photo to my iPad and transformed it into a watercolor. Super simple. I do have several tips to share. Let’s look at the progression from the before and after. I found that once I lightened the original photo the app would fail to read some of the finer details that I wanted to keep. I also found in order to have an ideal blue sky, I needed to over compensate. I use Photoshop to make my edits, but there are other free or nearly free apps available that can do these simple edits fairly effectively. I’ve played around with You Doodle. On first glance, it looks pretty juvenile, but I used it to darken on of the roofs in one of the houses. 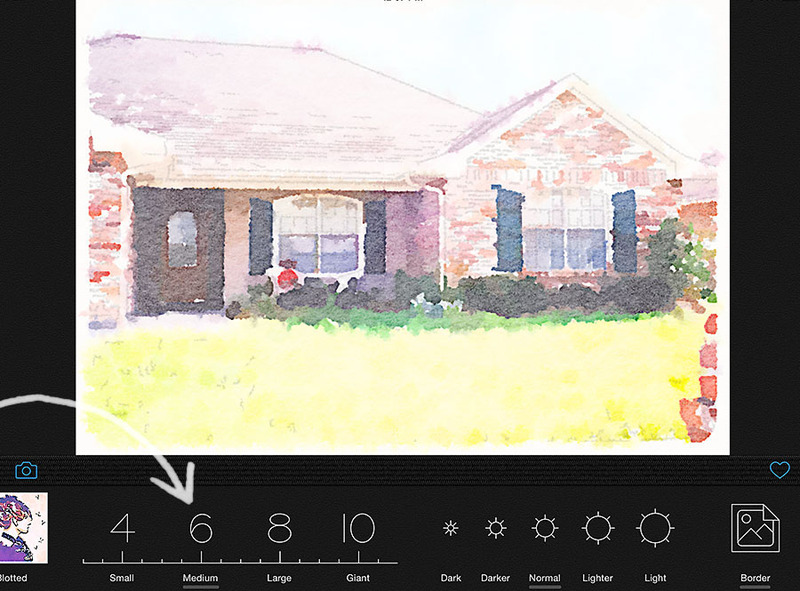 In the Waterlogue app, there are choices for the ways in which the app “paints” your photos. 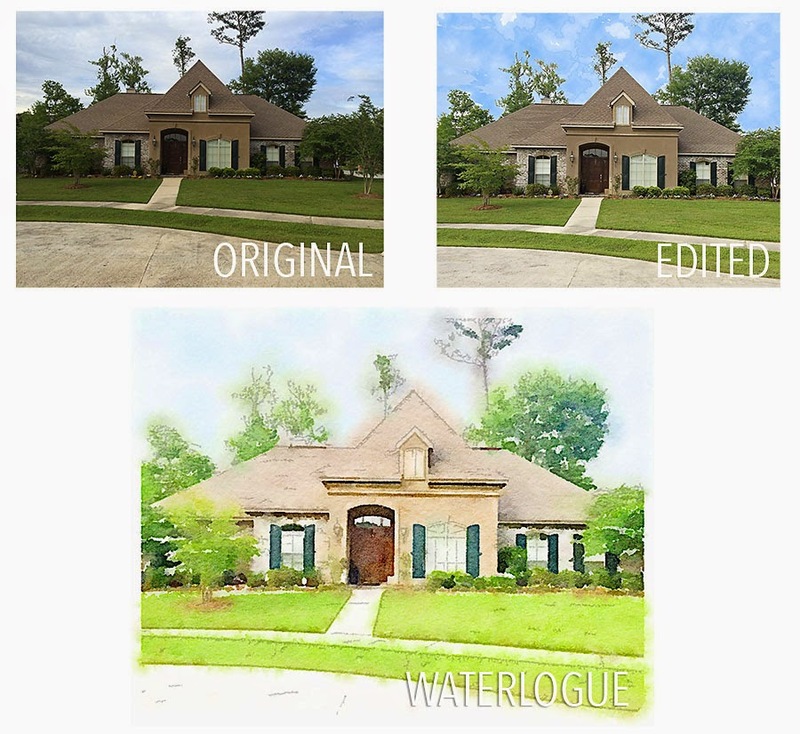 For most of my houses, I used the Natural style of painting, the first one on the left. For a few of them I used the Color Bloom option, the last option shown on the right in the image above. Be sure not to miss the brush and brightness controls at the end of the bar. Not only can you make your painting brighter, you can also adjust the size of the brushes strokes which can give you more definition. 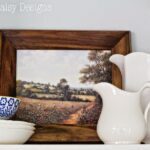 Just scroll all the way to the end of the painting styles to find those adjustments. Once all of my photos were converted into a watercolor, I sent them to my local Staples to have them printed on 20 lb stock paper with a matte finish. I thought this mimicked the watercolor paper fairly well, much better than printing on my color printer. 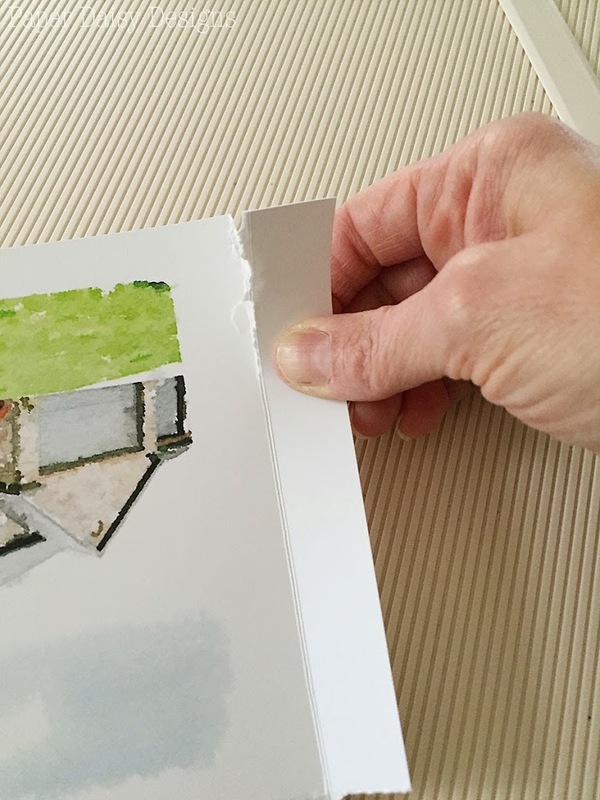 To enhance the watercolor look, I wanted the edges of the paper to be torn. There is definitely a technique to tearing paper properly. I used to teach an hour long class on paper tearing during my days as a scrapbook instructor. The easiest way to have a controlled tear is to score your edge. 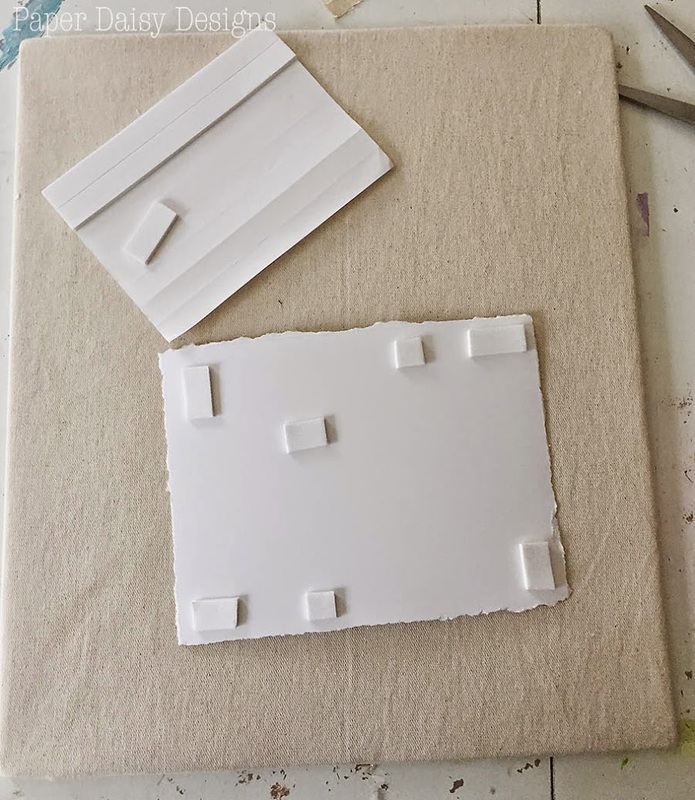 Here I’m using a Martha Stewart Crafts Scoring Board and Envelope Tool . 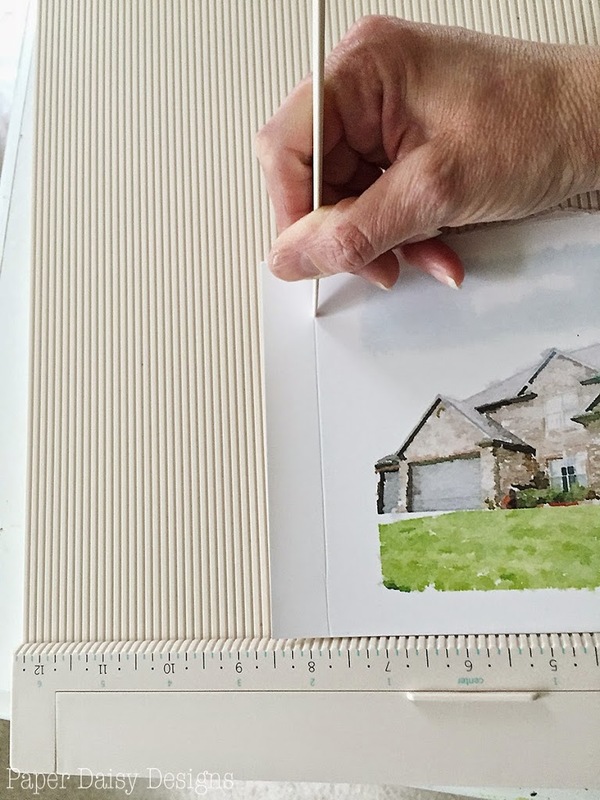 It is a very handy device that perfectly scores the paper, but you can also simply create a fold, creasing the paper by hand. Now you are ready for the actual tearing. Because you want the texture of the tear to be seen, you will tear upwards like this. I’m taking a photo of my own hand here, so in all actuality I hold the paper with my left hand and make the tears upwards with my right hand. Keep your holding hand and tearing hand fairly close together will also help control the tearing. 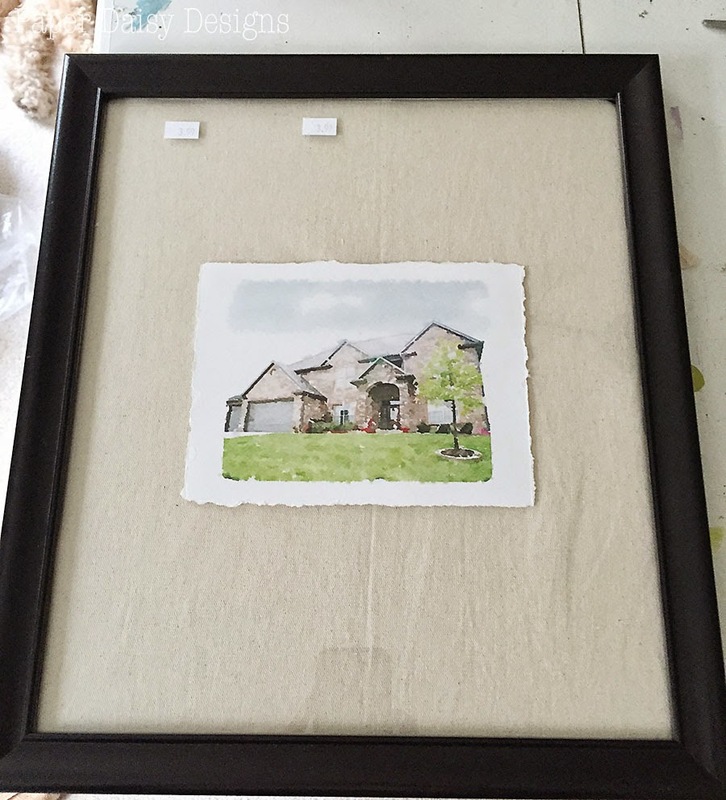 To mount each, I wrapped some scrap cotton fabric around the cardboard backing that came with each frame. I got lucky and picked up a set of 8 frames at my local Salvation Army for less than $3 a piece. I simply secured the fabric to the back of the cardboard with Duck Tape. To get tight corners, I wrapped and trimmed as I would for upholstery work. 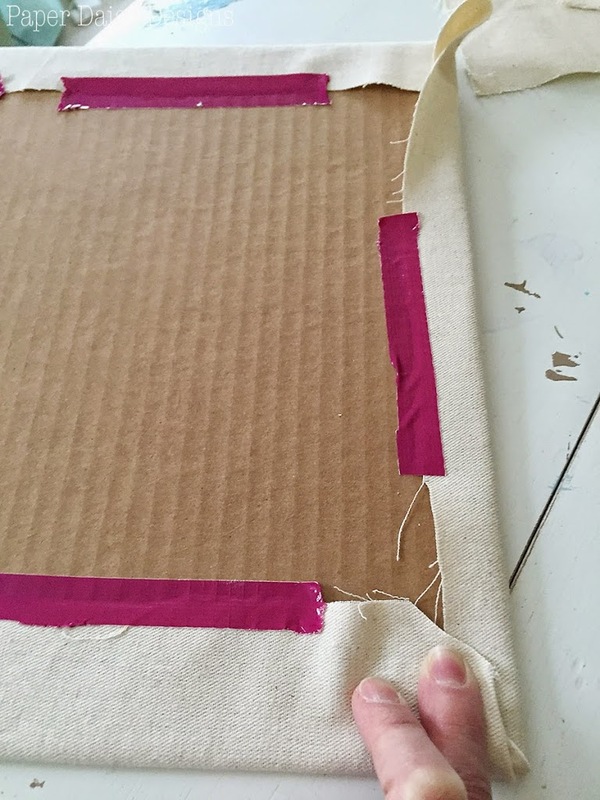 To remove the bulk of the fabric you’ll want to trim the triangular corner off, but be sure to leave about a 1/4″ at the corner. 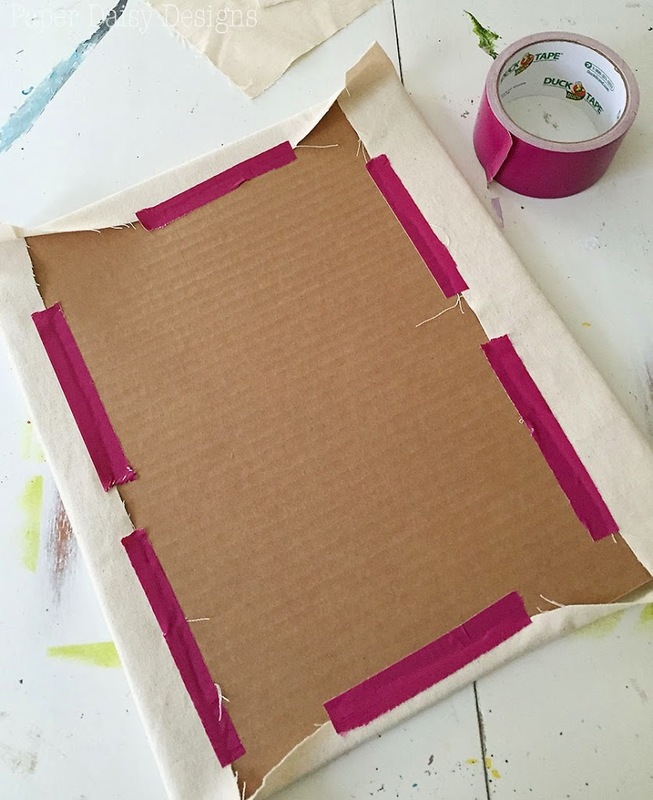 Then simply fold the sides in and tape. 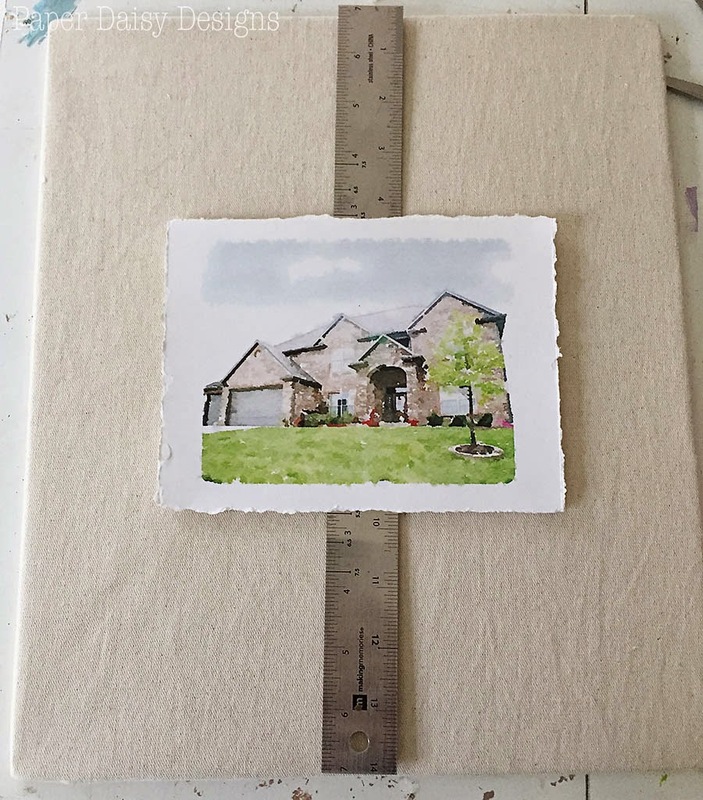 For added dimension, I added foam squares to the back of each watercolor print. My foam placement seems a little random, but that is because I wanted to allow for my ruler to slide out from underneath. 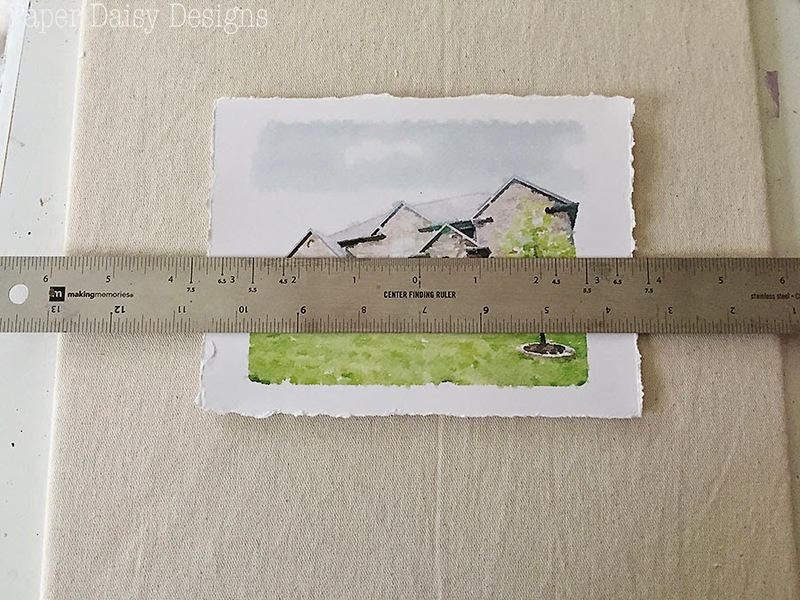 For precise work like this, I rely on my centering ruler. Don’t know what that is? It’s a ruler that looks like this. Like I said, the frames were very inexpensive from Salvation Army. They were severely lacking in the mounting department. 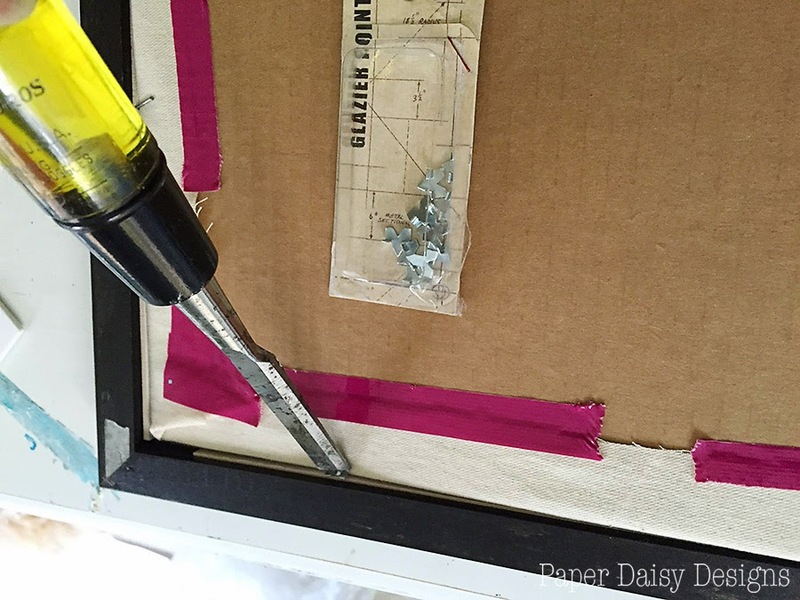 I added several glazier points around the back of the frame to securely hold the art in place. I find it is easiest to push the glazier points into the frame with a flat edge screw driver or this chisel works well. I would also recommend ironing your fabric. I did, but I probably should have used starch as well. It wasn’t until they were framed that I realized I didn’t get all of the wrinkles out. Even though these are just resting on the shelf, I learned the hard way that they should be secured to the wall at least a little. One crashed to the floor while I was placing them up on the shelf during on a trial run. Thank goodness I had one extra frame. 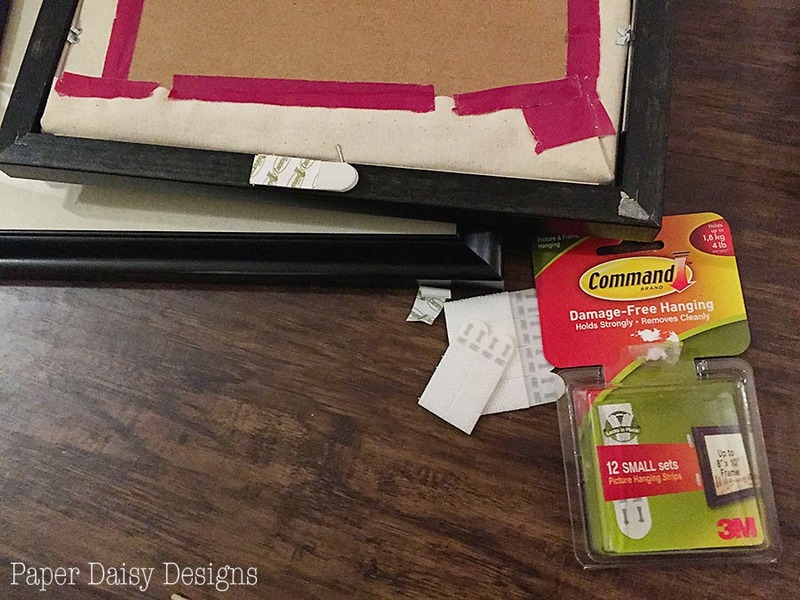 I used these Command Adhesive hangers that work like Velcro attaching the frame to the wall. I used one pair at the top of each frame. Like I said in the Board and Batten post, this is an extremely hard area to photograph. With no natural light and the glare from the glass, it’s just crazy hard to get a good close up. 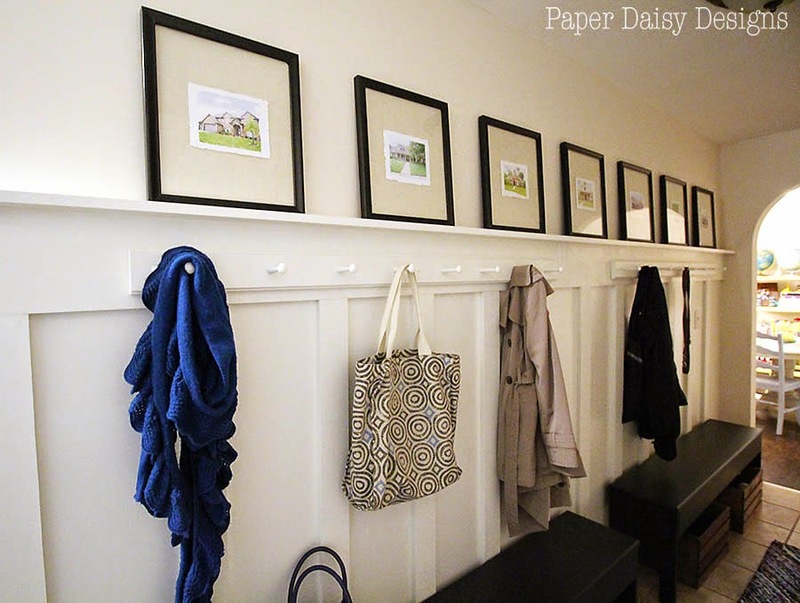 Despite that, the board and batten and the prints have brightened this mudroom hall. A true makeover if ever I saw one. I love that our entry into the place we call now home is now filled with the visual reminders of our past homes. Or maybe this one, “Home is where you hang you hat.” Ha, ha! Either way, I’m happy and feel blessed to call this place home. What about you, have you moved a lot? 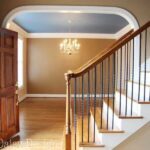 Got a long hallway to decorate? Tried your hand at “watercolor”? 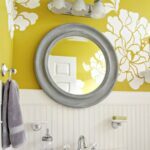 Such a creative way to display your past! This is such a beautiful and creative idea, I love this! Now, if only I was at least a tiny bit crafty! Such an awesome idea! I&#39;m going to have to try this! Love this! 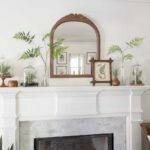 I need these tips badly for my home. 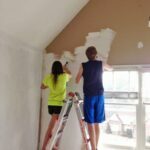 Now can you come over and make over my house!? lol. Happy New year! 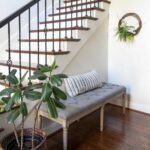 Your home looks amazing! What a great idea! 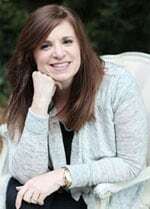 If you haven&#39;t had a chance to share this on the Merry Monday Link party, please stop by! Pinning. I love this! So creative. 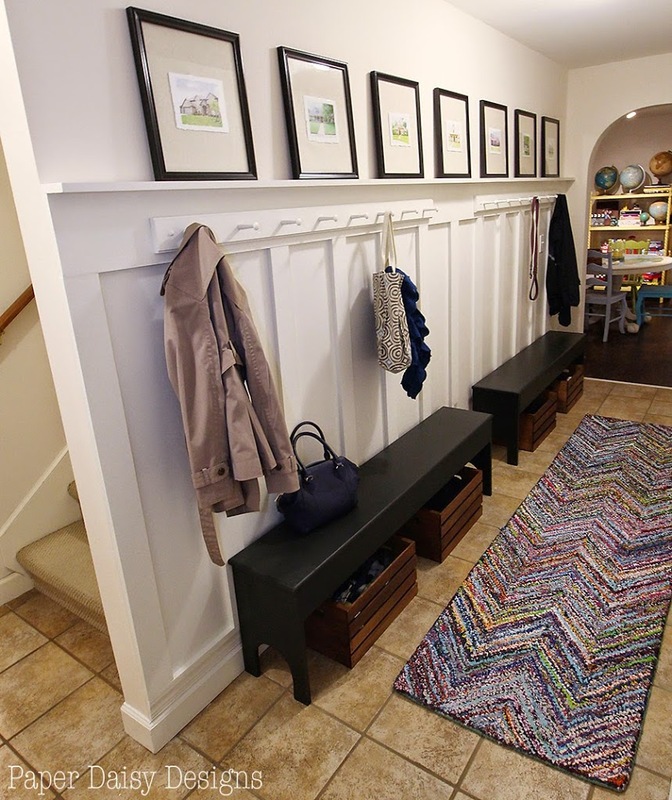 Also, I ADORE that hallway. Like, all of it!! I love this. It is very creative.